Today I want to address an issue that I often deal with: is it better to buy a TWIN-SPINDLE or the MULTICENTER? Looking at how often I am asked this question, I decided to dedicate an article to the subject. THE MOST INSTINCTIVE CHOICE FOR 70/80% OF PEOPLE: INCREASING THE NUMBER OF MACHINES. THE ONE DESIGNED FOR THOSE WHO STOP TO THINK FOR A MOMENT: TWIN-SPINDLE MACHINES. THE CARD UP YOUR SLEEVE, RESERVED FOR THOSE WHO WANT TO EXAMINE SOMETHING CAREFULLY: THE MULTICENTER. Let’s analyse, step by step, the 3 options described above starting with the most instinctive one, i.e. to increase the number of machines. As mentioned, this is the most instinctive option. I produce 200 pieces with one machine, I have to produce 800 pieces. What do I do? Buy another 3 machines. Why am I speaking of INSTINCT? Because INSTINCT is an automatic behaviour. This means that it is not the result of learning or of personal choice. Instinct has a rather rigid relationship with what you desire. A peculiar characteristic of an instinctive action is the lack of bases from past experiences, but it seems to be an innate behaviour, as if it had come from a characteristic inherent in our genetic makeup, and is carried out in a similar way by different individuals, often without a clear purpose. This statement is the biggest problem and the biggest obstacle that limits the innovative thinking process. If you think for a moment, with a little common sense, you will understand how the above would have stopped technological evolution. Returning to the merits of this solution, it is true that by buying two more machining centres, your production will increase from 200 to 600 pieces, but with production, your costs will also linearly increase. 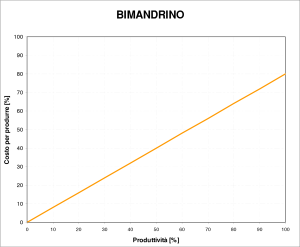 As you see in the graph above, you have increased production, but also your costs in a linear way. You should actually look for a way to increase production, but without proportionally increasing your costs, in order to generate more profit to your advantage. With this statement we will now move on to the second solution, i.e. using a more productive machine to increase our production, a TWIN-SPINDLE, because the TWIN-SPINDLE is a single machine, but produces double the amount compared to a normal machining centre. Here your cost-effectiveness curve starts to appear less linear and, as you can see in the graph below, leads you to increase productivity, though not in proportion with your costs. 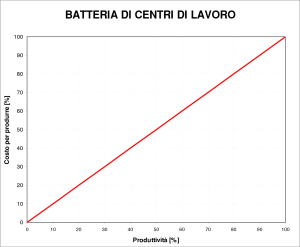 This curve is modified because, for example, labour is affected less in proportion to production. Indeed, with 3 machines you will have 3 operators, while with a single-spindle and a twin-spindle machine, there are just 2 operators. Production increases, costs less so. If we go into more detail, also the space occupied (which today increasingly represents a cost) is less with a TWIN-SPINDLE than with 2 conventional machining centres, just as a single chip conveyor, a single hydraulic unit, and so on. If you are not already familiar with the technology of the MULTICENTER, I will briefly summarise the concept: it is a machine that has just one main body, where a rotating pallet with 4 stations is installed inside. A station is dedicated to the loading / unloading of the piece during machining, while the other 3 are machining stations. In each work station there is an actual 3-axis machining centre with a tool changer and a B axis rotating at 360° on the main pallet. To better understand how this machine works, click on the video below. You’ll see it working unladen and without any internal protection in order to understand how it works conceptually. 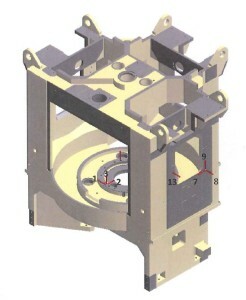 As you could see from the video, the MULTICENTER contains 3 machining centres in a single machine, therefore producing a proportionally greater amount of pieces, but the production costs do not increase in proportion. As noted from this graph, productivity is not proportional to the operating costs. This is the real advantage of using the MULTICENTER! 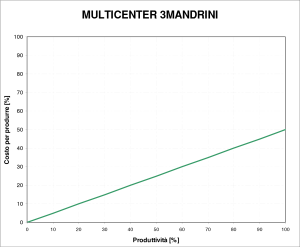 Now I will spare you the comparison between 3 machining centres and a MULTICENTER – too easy to win. Here is a list of the main advantages compared to the TWIN-SPINDLE. Let’s start with a bang, only this point applies to the choice in favour of the MULTICENTER compared to the TWIN-SPINDLE. This point was not prepared beforehand, but I noticed that in competitive environments such as the AUTOMOTIVE industry and/or in environments with little specialist labour, the MULTIICENTER has a huge advantage. As its name implies, the TWIN-SPINDLE is a machine with a double spindle, which means I can obtain two pieces instead of one in the same cycle time. But by doubling the spindle I need to double the tools in the machine and that’s why the result is that I have two independent processes with potentially different results so I have to oversee both processes. What do I mean? One spindle might produce the piece, while the other does not produce the piece within the tolerance values or it comes out vibrated as a result of different tools. In the case of the MULTICENTER, the concept is totally different with a huge advantage, because despite having 3 machining centres, the tooling is not for 3, but it is always the same divided by the 3 machining centres. Basically, there is just one process, but at the speed of 3 centres with 3 independent processes. You understand how it is easier to control one process instead of two independent processes. If you have components subject to statistical analysis, the MULTICENTER succeeds better at staying within the tolerances and it is easier for the operator to make corrections without too much trouble. Speaking of tooling operators, I imagine that you too, like many other companies, find it increasingly difficult to find skilled labour able to quickly and correctly equip machines. Equipping a TWIN-SPINDLE is worse than equipping two individual machines! This is what I was told by a user of twin-spindle machines, who explained that the tooling phase was complicated. If you think of how a twin-spindle machine works, you have virtually two identical tools that are processing two components side by side at the same time. The difficulty lies in having to identically preset the tool length and any slight difference will be shown on the final piece, thus producing similar pieces to each other but not identical. And it is not just this aspect of producing with two independent processes that complicates the tooling, but also the equipment! Indeed, even in terms of clamping the workpiece – where each workpiece must be clamped in the same way – there is no chance of an offset, but everything has to be mechanically perfect! Instead, with the MULTICENTER, featuring a single process, the tools are not split and this “Swiss-like” operation is not required. This considerably simplifies the work of the tooling operator and the same applies to the workpiece clamping stage, as each clamp has its own offset and can be managed independently. This allows you to effortlessly produce identical quality pieces without troubling the tooling operators – who, as I understand it, have TWIN-SPINDLE nightmares, a widespread disease in the world of production! Now I will illustrate why it is not just a slogan that machine tool manufacturers use all too often, but is a very precise and clear construction method supported by an honours thesis developed at the Faculty of Mechanical Engineering of the University of Brescia. A total of 99% of machining centres both with a vertical, horizontal spindle, single-spindle or twin-spindle have an OPEN type base frame, unlike the MULTICENTER which has a CLOSED type base frame, a well-structured cell that is not affected by conflicting forces. Below you can clearly see what I mean by open structure in machining centres. In the case of the MULTICENTER, the base frame is CLOSED and the forces applied to the structure itself cannot alter the cell. Having examined the main frame, let’s move on to the work module. Its strength is provided by the distance interposed between the spindle axis, where the bearings are housed, and the distance of the linear guides. 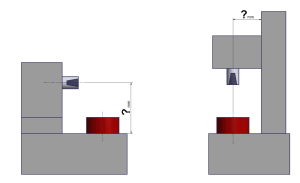 In the case of machining centres, the measurement ranges from 600mm to 1000mm, in the case of the MULTICENTER the distance turns out to be 200mm all in favour of strength, which means less vibrations, longer tool life and longer machine life in terms of bearings, which are often damaged by vibrations. If you are interested in further examining the subject of strength, download the honours thesis developed by the Faculty of Mechanical Engineering of the University of Brescia by entering now your email address below to receive it straight away. With the twin-spindle you are committed to producing two identical pieces, you cannot equip a twin-spindle with two different pieces because, as we have seen, everything is limited to double the amount and not otherwise. There are more and more cases where the customer uses the MULTICENTER to produce two different pieces, maybe two pieces that must then be assembled together, therefore you can dedicate two stations to piece A and two stations to piece B. This way, at every two pallet intervals you obtain the parts ready for assembly without having to produce all the A pieces, then stop, retool the machine and produce all the B pieces. This method of simultaneous production of pieces which then forms an assembled unit goes in the direction of LEAN MANUFACTURING. A TWIN-SPINDLE centre has an average life of 15 years, after which it is ready for retirement, perhaps a year more or less. The MULTICENTER is built with techniques that we have been using since 1958, techniques that have increasingly improved and result in our machines with 30 years of life being retrofitted electronically, but maintained mechanically. Personally, I have never seen a twin-spindle machining centre being retrofitted, because the end of the service life of the electronics normally coincides with the mechanical one, so the MULTICENTER gives you extra value! Now, I wonder if that I summarised above in 5 simple points is always taken into account by those who must choose whether to buy a TWIN-SPINDLE or a MULTICENTER. Since 2005, in other words for the past 10 years, we have been gradually introducing this new product by opening a new category in the machine tool world, the MULTICENTER. Thanks to MULTICENTER, for the last 10 years we have been leading the category, forcing others to join in the mad scramble to somehow imitate this machine, which remains the only one built in series. Other companies in the sector have thrown in the towel and have surrendered, faced with our focus on further perfecting this machine which, thanks to the many models produced today, has reached a level in no way inferior to the best Japanese manufacturers. THE SAME MACHINES YOU HAVE ALWAYS USED IN THE PAST? Please enter your email to fix an appointment with me to examine together your challenge to become competitive now. In the past, in just 3 months, I have made companies competitive, companies which up until then were struggling to survive on the market and thanks to the MULTICENTER they overcame their challenge. Right now you don’t need to evaluate any project, but are you interested knowing more about flexible production? unexplored and under-exploited, where there is value to be transformed into profit!